I asked B.B. King back in the late ’70s why he never played guitar and sang at the same time. His explanation all but defines the man: That he could only give his all to one or the other at a time. And that he had to give his all to both. 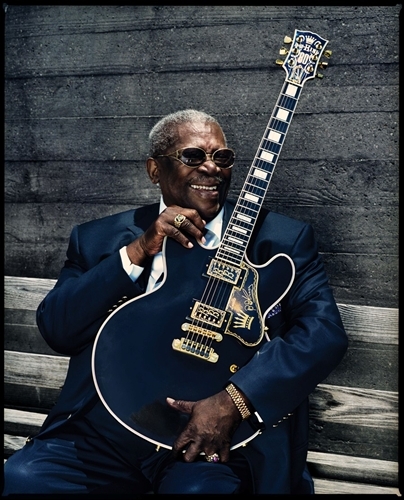 King gave his all to blues music, and as a result became its preeminent ambassador the world round. A kind, warm and dignified man, it seems he never forgot his rural Mississippi sharecropping roots and how music raised a boy who was on his own from age 14 out of abject poverty, exploitation and racism. But rather than let the pain of his past fester into anger and resentment, he channeled it into his music. Sadness and anguish suffused his voice, and it could be heard in the sting, sad howls and tearful quivering tremelo within his clean, economical and eloquent guitar lines. His music always bore his own immediately recognizable stamp, yet it blended not only both rural and urban blues but R&B, jazz, big band, classic pop and much more to fuel his wide appeal. After his single “3 O’Clock Blues” hit #1 on the R&B charts for a 15-week run in 1952, King hit the road and never looked back, playing hundreds of shows every year for some six decades until his health began to wane. At first it was the clubs of the “Chitlin’ Circuit” across the south and the African-American theaters in most every sizable American city. After the black audience turned its attention to other styles in the early 1960s, he found new fans in the booming folk and rock music scenes, scoring his biggest hit in 1970 with “The Thrill Is Gone,” eventually becoming a notable popular entertainer enjoyed by a wide range of audiences anywhere there might be a stage – all the while never compromising his music. It was something that may seem almost insignificant to some that wowed me and sticks in my memory from a King show at New York’s Beacon Theater in the 1980s. Partway through he broke a string. He kept singing as his saxophone player (also his nephew I believe) got a new string from a packet atop King’s amp as B.B. removed the remains of the old one, all the while never straying out of step from the song. He then casually threaded it through the tailpiece of “Lucille,” his famed Gibson ES 335, and into the tuning pegs on the headstock, standing at the mike and singing as if nothing was amiss. He wound it up, pulled at the string to check its tension, tightened it a bit more – all without using a tuner – and then lit into a lead with the string perfectly in tune. In every way from small to large, he was a consummate professional musician. I could spend many words summarizing all his awards, honors and accomplishments and listing the scores of classic rock guitarists who King influenced and inspired – all that is easily available elsewhere. But the best way to honor him is simply to listen to his music. Born Riley B. King, he was nicknamed “Blues Boy” during his time on the Memphis radio station WDIA in the late 1940s, later abbreviated to B.B. But to the many millions who heard him in the years that followed, he was the Blues Man. Sure, others played faster and with greater fury; others may have sung better (and he was happy to share the stage with one, Bobby “Blue” Bland, on a number of tours together). But few if any blues artists (or rockers for that matter) did it all with the regal mix of majesty, gentility and heart implied by his surname. B.B. King earned his crown and wore it well. And though now no longer with us, his music will live on eternally.